Extensive literature demonstrates that physical activity is a safe and effective adjunct to typical medical and pharmaceutical treatment of arthritis, osteoporosis, and low back pain.24 Serious adverse events are rare when such patients exercise; event rates for arthritis (0.6%), osteoporosis (2.4%), and low back pain (0.06%) are sufficiently low that the risk-to-benefit ratio is strongly in favour of the prescription of PA.24 However, it must be emphasized that the criteria for entry into most of the published studies excluded individuals with cardiovascular or cardiopulmonary disease, and prescription guidelines should be viewed in this context. Certain conditions predisposing this group of patients to adverse events during PA have now been identified and have been incorporated into the clinical decision trees presented here that aid practitioners in categorizing patients into high-, intermediate-, and low-risk categories, with corresponding differences in appropriate exercise prescriptions and requirements for supervision of PA. Conditions predisposing patients to increased risk are highlighted in these figures, and a summary of current recommendations for each of the 3 conditions is provided in the accompanying tables. Patients with rheumatoid arthritis or osteoarthritis are at increased risk of cardiovascular disease, even if they do not currently have overt manifestations of such disease, and thus an evaluation of cardiovascular risk factors should be included in assessment of such patients. There is no evidence of any absolute contraindications to exercise in patients with arthritis; however, the literature strongly supports the recommendations for risk classification and activity prescription outlined in Table 1 and Figure 1. 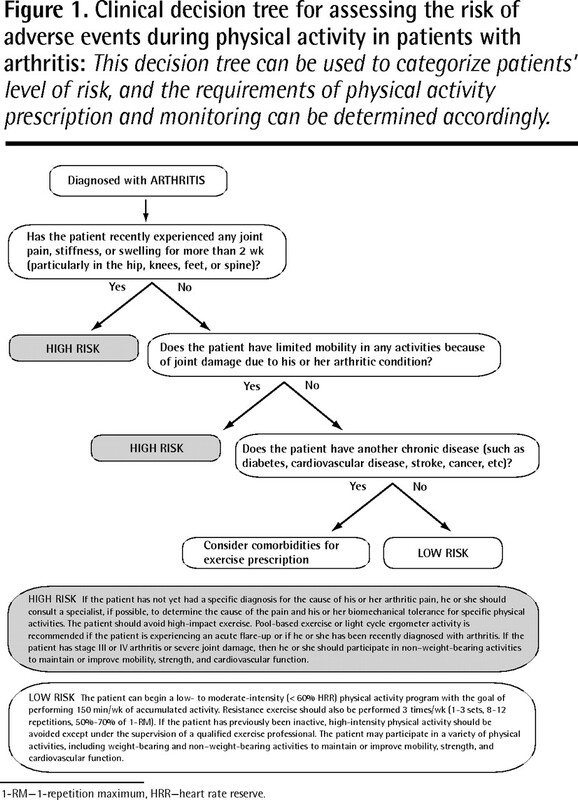 Clinical decision tree for assessing the risk of adverse events during physical activity in patients with arthritis: This decision tree can be used to categorize patients’ level of risk, and the requirements of physical activity prescription and monitoring can be determined accordingly. 1-RM—1-repetition maximum, HRR—heart rate reserve. The incidence of either minor or serious adverse events in patients with low back pain is low. Thus, we do not suggest any absolute contraindications to PA. However, as most research studies to date screened out patients with serious underlying conditions, the recommendations outlined in Table 3 and Figure 3* should be restricted to patients without serious underlying conditions. Current evidence suggests that PA participation has a favourable risk-to-benefit ratio for most patients with arthritis, osteoporosis, or low back pain. The risk of adverse events is somewhat higher in certain categories of patients, and specific recommendations for PA and its supervision should be based on decision trees incorporating individualized risk classification. ↵* The clinical decision trees for osteoarthritis and low back pain (Figures 2 and 3) are available at www.cfp.ca. Go to the full text of this article online, then click on CFPlus in the menu at the top right-hand side of the page.
. Revisiting arthritis prevalence projections—it’s more than just the aging of the population. J Rheumatol 2006;33(9):1856-62.
. Burden of osteoporosis and fractures. Curr Osteoporos Rep 2003;1(2):66-70.
. 2002 clinical practice guidelines for the diagnosis and management of osteoporosis in Canada. CMAJ 2002;167(10 Suppl):S1-34. Errata in: CMAJ 2003;168(4):400, CMAJ 2003;168(5):544, CMAJ 2003;168(6):676.
. A population-based analysis of healthcare utilization of persons with back disorders: results from the Canadian community health survey 2000–2001. Spine (Phila Pa 1976) 2006;31(2):212-8.
. Refining the measurement of the economic burden of chronic diseases in Canada. Chronic Dis Can 2004;25(1):13-21.
. Does back pain prevalence really decrease with increasing age? A systematic review. Age Ageing 2006;35(3):229-34. Epub 2006 Mar 17.
. Aquatic exercise for the treatment of knee and hip osteoarthritis. Cochrane Database Syst Rev 2007;(4):CD005523.
. Exercise for osteoarthritis of the hip or knee. Cochrane Database Syst Rev 2003;(3):CD004286.
. Exercise for osteoarthritis of the hip. Cochrane Database Syst Rev 2009;(3):CD007912.
. Therapeutic exercise in physiotherapy practice is beneficial: a summary of systematic reviews 2002–2005. Aust J Physiother 2007;53(1):7-16.
. Dynamic exercise programs (aerobic capacity and/or muscle strength training) in patients with rheumatoid arthritis. Cochrane Database Syst Rev 2009;(4):CD006853.
. Exercise and bone mineral density at the femoral neck in postmenopausal women: a meta-analysis of controlled clinical trials with individual patient data. Am J Obstet Gynecol 2006;194(3):760-7.
. Exercise for preventing and treating osteoporosis in postmenopausal women. Cochrane Database Syst Rev 2002;(3):CD000333.
. Exercise and bone mineral density. Sports Med 1995;19(2):103-22.
. American College of Sports Medicine position stand: physical activity and bone health. Med Sci Sports Exerc 2004;36(11):1985-96.
. Reducing the risk of falls through proprioceptive dynamic posture training in osteoporotic women with kyphotic posturing: a randomized pilot study. Am J Phys Med Rehabil 2002;81(4):241-6.
. Diagnosis and treatment of low back pain: a joint clinical practice guideline from the American College of Physicians and the American Pain Society. Ann Intern Med 2007;147(7):478-91. Erratum in: Ann Intern Med 2008;148(3):247–8.
. Comparison of general exercise, motor control exercise and spinal manipulative therapy for chronic low back pain: a randomized trial. Pain 2007;131(1–2):31-7. Epub 2007 Jan 23.
. Meta-analysis: exercise therapy for nonspecific low back pain. Ann Intern Med 2005;142(9):765-75.
. Advice to rest in bed versus advice to stay active for acute low-back pain and sciatica. Cochrane Database Syst Rev 2010;(6):CD007612.
. Bed rest for acute low-back pain and sciatica. Cochrane Database Syst Rev 2004;(4):CD001254.
. Evidence-based risk assessment and recommendations for physical activity: arthritis, osteoporosis, and low back pain. Appl Physiol Nutr Metab 2011;36(Suppl 1):S49-S79. Epub 2011 Jul 29.
. PAR-Q+. The Physical Activity Readiness Questionnaire for everyone. Ottawa, ON: Canadian Society for Exercise Physiology; 2011. Available from: http://parmedx.appspot.com/. Accessed 2011 Nov 24.
. ePARmed-X+ online. Electronic Physical Activity Readiness Medical Examination. Ottawa, ON: Canadian Society for Exercise Physiology; 2011. Available from: http://parmedx.appspot.com/. Accessed 2011 Nov 24.
. Postmenopausal spinal osteoporosis: flexion versus extension exercises. Arch Phys Med Rehabil 1984;65(10):593-6.